Published: Sept. 10, 2018 at 01:44 a.m.
Take a look at the top 10 images from Week 1 of the 2018 Season. 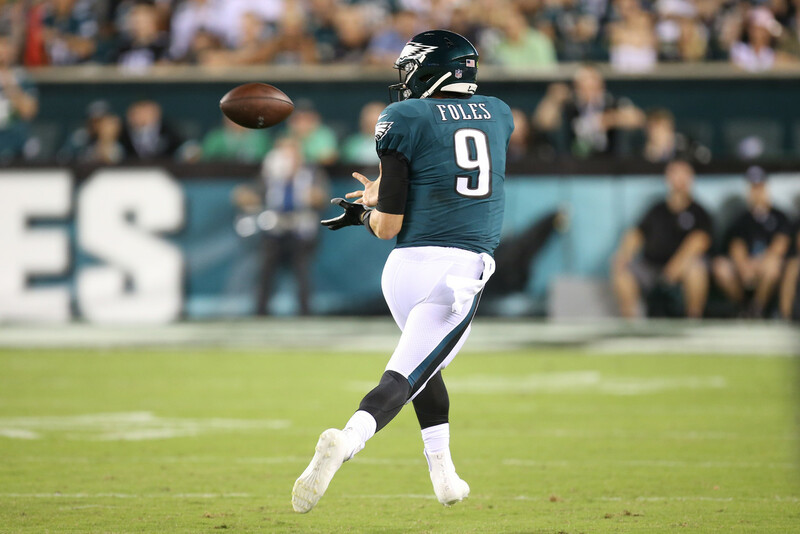 Philadelphia Eagles quarterback Nick Foles (9) catches a pass thrown by wide receiver Nelson Agholor (13), replicating a nearly identical play that the Eagles ran against the New England Patriots during Super Bowl LII. The Eagles outscored the Falcons 18-12 to take the win. Pittsburgh Steelers wide receiver Antonio Brown (84) celebrates a touchdown with wide receiver JuJu Smith-Schuster (19) in the end zone during an NFL football game against the Cleveland Browns in Cleveland, Ohio. The week one bout between the Steelers and Browns ended in a 21-21 tie. Baltimore Ravens wide receiver Michael Crabtree, right, pulls in a touchdown pass under pressure from Buffalo Bills defensive back Phillip Gaines (28) during the first half of the game in Baltimore. Dallas Cowboys' Dak Prescott (4) reacts after making a 2-point conversion against the Carolina Panthers during the second half of an NFL football game in Charlotte, N.C. The Cowboys were defeated 16-8 by the Panthers. Tampa Bay Buccaneers wide receiver Mike Evans (13) carries against New Orleans Saints cornerback Marshon Lattimore (23) in the second half of an NFL football game in New Orleans. Carolina Panthers quarterback Cam Newton (1) runs onto the field as flames shoot into the air prior to to an NFL football game in Charlotte, N.C.
Washington Redskins running back Adrian Peterson (26) is hit as Arizona Cardinals defensive end Benson Mayowa (91) pursues during the second half of an NFL football game, Sunday, Sept. 9, 2018, in Glendale, Ariz. Peterson racked up his 100th career touchdown during Washington's 24-6 victory over Arizona. Chicago Bears linebacker Khalil Mack (52) strips the ball free from Green Bay Packers quarterback DeShone Kizer (9) during the first half in Green Bay, Wis. Despite Mack's outstanding defensive play only having arrived in Chicago a week prior, the Packers narrowly took the lead in the fourth quarter with a 24-23 victory over the Bears. Kansas City Chiefs wide receiver Tyreek Hill (10) flips in celebration after a fourth quarter touchdown against the Los Angeles Chargers at StubHub Center. Hill averaged 24.1 yards per catch and scored two touchdowns in the Chiefs' 38-28 victory over the Chargers.